As with all emerging technologies in their heyday, it takes time to understand their true advantages and responsible use. Augmented Reality (AR) is no different. Are you equipped to make the most of this amazing digital frontier? What is AR’s true potential for online training? The internet was initially developed for military use. We didn’t foresee it as a paradigm-shifter for society. But internet broke into mass culture, instilling itself into the daily lives of common people. Positivity and intellectual benefits were not all that it brought. It took a decade or more to adapt to this powerful tool and learn how to use it responsibly, as well as how to realize its potential for online training, social development, democratization and research. Augmented Reality is in its infancy, much the same way the internet was in the 90’s, and we are just beginning to realize that it has much more to offer than Pokemon Go. Here are 4 best practices to create online training courses with AR tech. Discover all the benefits of using Augmented and Virtual Reality technologies in eLearning. Humans are prone to losing sight of the ends, getting caught up in charms and the coolness of the means. A great example of this is computer-generated imagery (CGI) and 3D viewing technology in Hollywood. Without naming, we can all agree that a large majority of post-millennial blockbuster cinema fell prey to the cool factor. The urge to show off the amazing things possible with the new-found power of computer graphics and 3D technology. There was a cart-before-the-horse reversal as the creative and narrative aspect began to be dictated by the technological aspect rather than vice versa. As Marshall McLuhan said "The Medium is the Massage" and the form starts to supersede the content. What we are left with is an industry of vacuous eye-candy, not meaningful content that engages with life. When creating immersive online training courses, the content should drive the technology, not the other way around! Apply this wisdom by focusing on learning objectives when designing the online training course, then later see how Augmented Reality can help these. Remember, cool has a short and fickle shelf life! Content is what people actually take home with them. We can understand the nature and utility of any technology by analyzing what it offers that other technologies don’t. Comprehension by comparison is an excellent tool to optimize your use of a new technology. By identifying what a non-AR online training course cannot do, you can understand what Augmented Reality can do for the online training experience. Here lies the true potential of AR-based learning. It has a unique advantage as a learning tool to develop types of intelligences that text and images cannot. Due to the immersive and experiential nature of Augmented Reality, online training has a true-to-life impact on human consciousness. It can allow online learners to experience difficult emotions like fear, stress, anxiety, anger, conflict and confusion. This opens up a world of new possibilities for immersive online training. Phobias and fears can be overcome, while stress coping mechanisms can be learned in an experiential way. Crane operators, mechanics and construction workers can be helped to develop better spatial intelligence, sense of balance and a grip over fear of heights. Dealing stocks in a noisy, high-speed and stressful environment at a stock exchange in real time. Medical staff can be given a chance to experience the emotional and psychological challenges of life at the hospital such as disturbing sights, unpleasant experiences, death, quick responses, teamwork, dealing with worried relatives and seriously ill patients. Safety training which places industrial and aviation workers in a realistic online training experience that actually puts them face to face with disasters. 4. Learner-Based Interactivity - One Size Does Not Fit All! As human beings, we each have our own reality; that is what makes every person unique and their experiences important. 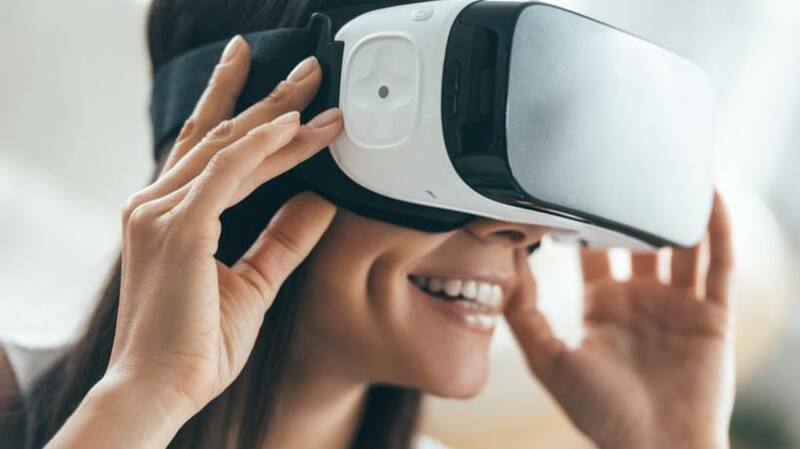 AR-immersion training can incorporate this with a highly personalized and learner-centric open experience which is customizable. Think of it as every online learner being their own best teacher, making it the trainer’s job to provide the tools. Incorporate interactive self-paced learning activities. Provide customization options based on the needs, existing level and psychology of online learners. This is not just more effective but also efficient. Imagine an online training course that allows corporate learners to choose focus areas and personalizes the Augmented Reality experience according to their psychological and emotional profile. Online training courses also need not be subject-fixed and employ an open source philosophy. Online learners could combine more than one type of training (e.g. medical with business management/administration) into one Augmented Reality experience. It’s also important to note that Augmented Reality is not the miracle cure to your online training pain points. It may hold a prominent place in the future of eLearning. However, the applications are primarily there to reinforce knowledge and support the subject matter. You must still provide your corporate learners with the online training resources and activities they require to master skills and absorb the key takeaways. For example, invite them to participate in an online training module that conveys the information, then use AR serious games to improve memory retention. What is AR/VR’s true potential for online training? 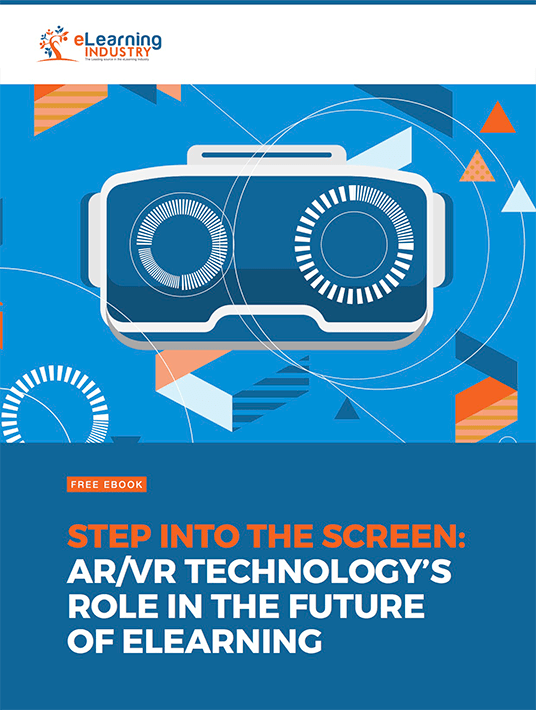 Download our free eBook Step into the Screen: AR/VR Technology's Role in the Future of eLearning to discover how to integrate AR/VR into your microlearning online training library, as well as the top alternate reality pitfalls to avoid when developing your online training resources. We’ll even offer a step-by-step guide to create AR and VR activities from the ground up.